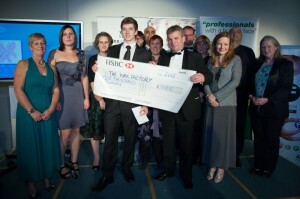 Harris & Harris were sponsors of the 2012 Frome New Business Competition run by Frome & District Chamber of Commerce. There were a wide range of entrants reflecting Frome’s range of artisan, creative and traditional businesses. They included Absolutely offering artisan preserves and pickles, Julia’s Kitchen with gluten & dairy free cakes, and Yumble with both sweet & savoury crumbles. We also had two great teams running café’s; the already successful Manor Café and Bayfield’s Coffee about to open at the new Health Centre. Traditional & creative industries were represented by Dean Press letterpress printing and John Walton a new blacksmith who will offer “make your own” days. Anyone doing one might then want a day at The Saltbox in Nunney which combines business skills training with therapies. The award was made at a gala event at Rook Lane Chapel. The judging panel, including Neil Howlett from Harris & Harris, with representatives from Superior Graphics, Old Mill Accountants, Sainsbury’s and MDC gave the award of £1,000 to The Wax Factory, a business started by a student doing his A Levels. They were impressed by the comprehensive strengths of a young entrepreneur who is continuing to run his business while doing a degree. All the competitors will continue to get support from the sponsors and from Wessex Chambers Business Support advisors.